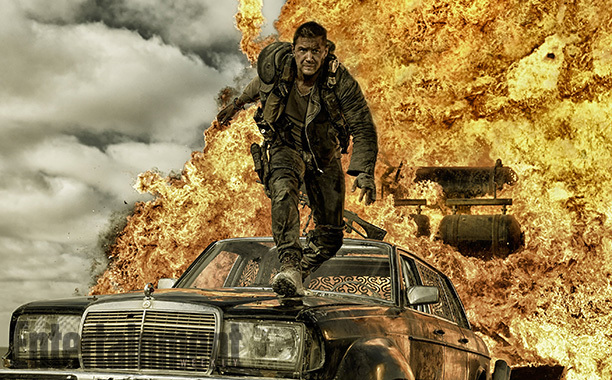 Watch the full trailer for Mad Max: Fury Road (May 15), which definitely looks like one of the summer highlights. George Miller, the originator of the dystopian genre, has craftily re-imagined Mad Max with Tom Hardy and Charlize Theron. Max Rockatansky still wants to wander alone, but becomes swept up with a group fleeing across the Wasteland in a War Rig driven by an elite Imperator, Furiosa (Theron). It still contains a retro vibe, but Miller utilizes new camera rigs and DI tweaking for a more intense and tactile thrill ride, aided by Oscar-winning director of photography John Seale (The English Patient) and action unit director and stunt coordinator Guy Norris (Australia).